Having become totally addicted to waterfall hiking we realized we had best do it safely and respectfully. We never go without the essential items listed below. On many occasions we have wished for an item from the non-essential list making a mental note to consider including it on the next hike. Non-slip footgear, preferably something that will also keep your feet dry in the colder seasons. Except for the warm summer days we wear hiking boots inside knee high rubber boots. We've worn old sneakers, boating shoes, old hiking boots or felt-bottomed reefers in the summer months. 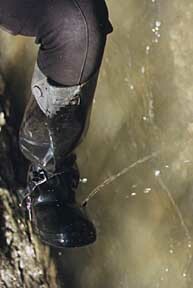 Instep four point crampons to prevent slipping on the rocks and to provide traction on the steeper areas. We purchased ours at the local outdoor equipment store. they stay warm even when wet. Hiking poles, adjustable steel tipped poles are best but old ski poles or sticks will do the job. Camera and small tripod so you can slow down the shutter speed and get the cottony effect of the water movement. We like to use our wide angle lens in some of the narrow spots. First-aid kit. Ours includes antihistimine pills and insect bite wipes. Space blanket or survival suit, essential in winter but a good idea in any season when hypothermia is a danger for an injured hiker. Knee high rubber boots (big enough to allow you to wear sturdy hiking shoes/boots). Fishermen's waders will also work quite well.